During last Thursday's pep rally, athletes got goofy, coaches got messy, and the Pacific Ridge community got into the Firebird spirit ahead of Friday's three basketball home games. 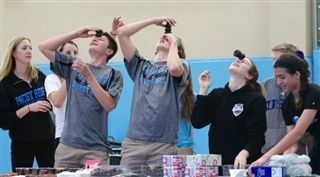 The Firebird Club led basketball players and coaches in a series of contests that included forehead donut stacking, pudding eating (with a twist! ), and a valiant breakdancing attempt by Coach Simmons, all to the delight of the student body. Best of all? The big laughs at the pep rally translated into a big crowd for the Friday evening games. Fight on, Firebirds!